Education Costs > How Much Do School Uniforms Cost? There are some private schools that choose to have students dress in uniforms rather than having a dress code. This is sometimes easier than trying to make sure each student is in dress code each day. Some people have false conceptions about uniforms; however, wearing a uniform does not mean that you wear the same outfit every day. Usually, uniforms have a few choices of bottoms, such as dress pants, skirts, shorts, capris, and a few choices of tops such as dress shirts, polos and sweater. These tops and bottoms can be worn in any combination at most uniform schools. School uniform pants can cost anywhere from $8-$25 depending on the size and brand. For example, a pair of flat front plain girls pants from Land’s End will cost $20. Uniform shorts, skirts, or capris, as well as shorts and pants for boys, will be in about the same price range, possibly a few dollars more. The cost of school uniform shirts can be between $7 and $20. A plain color short sleeved polo, girls or boys cut, from French Toast costs $13 while a long sleeved polo costs $14. School uniform shoes usually do not need to be purchased through a uniform store. The only requirement is usually that they be plain color dress shoes. JC Penney, for example, has many options ranging anywhere from $30 to $70. 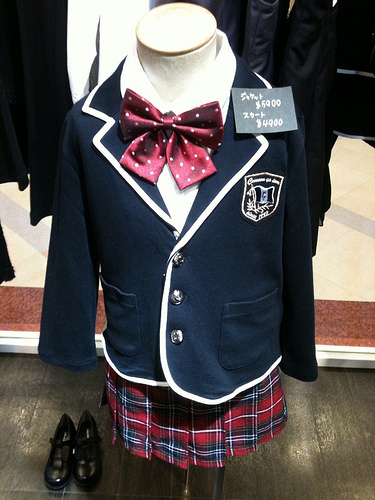 Accessories to school uniforms, such as socks, tights, and bows, also do not need to be purchased through a uniform store. These accessories will cost about $2-$10. At an average cost of $15 per item, purchasing ten tops and ten bottoms will cost about $300. On average, plan on spending $100 to $200 per uniform for your child. According to StatisticBrain.com, the average annual cost of a school uniform is $249. What are the extra school uniform costs? If you order your uniforms online, you will most likely have to pay a shipping and handling fee. Some schools require their name or symbol to be embroidered or printed on each shirt. There is usually an extra charge for this, although a few companies will include this in the price. Check with your school’s policy on this issue. In case the clothes do not fit perfectly, any alterations done to the pants or shirts will be an extra charge. If your child is in need of plus size clothes, these sizes usually cost a few dollars extra per item. Check with your local school to see if they have any ties to a particular clothing retailer. Local shops both online and offline can help in terms of getting discounts, and bulk packages. Many schools have their own official uniform store. Keep in mind that some schools will require that all clothing is purchased through this store, so you may have no choice if you’re looking to save money elsewhere. Don’t purchase something that fits snug as your child is in their growing stages. Try to purchase clothing that isn’t too big, but rather clothing that is loose enough so that they can grow into it. Try to purchase your uniforms early in the season. Retailers will mark their clothes up when it’s in demand. Avoid this by purchasing mid-summer, rather than two days before school starts. Ask your child what they are going to wear. If they won’t wear the sweaters, it may be silly to invest into these articles of clothing. It’s wise to know what your child will get the most use out of. If shopping online, try to purchase most if not all of your needs in one order. This way you will only have to pay shipping one time. Most school uniform items can be found through Amazon for a discounted price. Most stores offer discounts and coupons for frequent customers, and some local stores will even make a deal with your school if they suggest them as a retailer. Find out if the school has an exchange program. This exchange program is going to allow your child to swap with friends and fellow classmates. I think that school uniforms are STUPID!!!!!!!!!!! We bought at Lands end. I think it would have cost us a similar amount or more ($300) had we had bought regular school clothes (non-uniforms). jenny, $10 million is outrageous! I’d think uniforms are STUPID too if I lived where you live. My child goes to a public school and those who complain about it costing $150 for the school year… Seriously! How many uniforms does she have? Most shirts cost around $20, jeans around $40 and shoes are around $50 this is $110 for one outfit not including that she cant wear the same thing everyday. She also cannot wear what she wears in summer, in winter because she would be freezing and if she wore her winter clothes in the summer she would die of a heat stroke. So I would think $150 is really cheap for a year. Sending clothing items to and from Land’s End was a pain. My daughter is very petite and I couldn’t seem to get the sizes right for her, especially in the pants. I think if schools would have more of a dress code as far as colors for shirts and pants it would be way cheaper. Finding a pair of Khaki pants at target that fit right can be a lot more affordable than what Land’s End costs, and you don’t have to deal with the shipping costs.